At Station St., looking west under the Washington St. bridge. Only entrance to White Place. It would be interesting to note that the roadway passing under the bridge to the right of the railroad was the only access to White Place at the time since it was a dead end street. 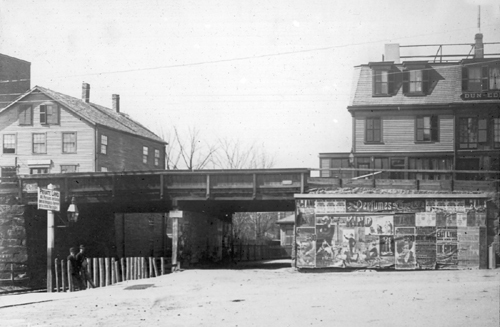 When the bridge was later widened, it was also shortened so as to only cross the railroad tracks. The end of White Place was filled in to meet the grade of the new bridge. That is the reason for the retaining wall between White Place and the "D" line which is located about where the center support of the bridge is.